‘America after the Fall’ is a lovingly curated, compactly formed new show at the Royal Academy’s Sackler Wing that aims to illuminate the full range of artistic responses to the Wall Street Crash of 1929 from some of the greatest names in American Modernism. As much a concise overview of a host of styles, themes and guises as an interrogation of what ‘America’ itself means, this crisp, sleek exhibition contains numerous works that are being shown outside the US for the first time; a multi-faceted combination of iconic images and more esoteric discoveries jostle for your attention across forty-five exhibits and some thirty-two names. The Sackler space at the gallery makes for a snug fit, as chief amongst the display’s virtues is its sure-footed economy, the lean precision of its juxtaposition. Encompassing the Great Depression and the beginning of the Second World War, ‘America after the Fall’ takes the crash as its catalyst and starting point before smoothly, succinctly easing its way through the gears, never resting on one school or mode of expression. As soon as you enter the opening room, it is evident that the adversity and turbulence endured by the nation’s people harnessed a potent, eclectic flowering of creativity and imagination amongst its artists. The upstairs wing at the RA accommodates such luminaries as Georgia O’Keeffe, Edward Hopper, Philip Guston, Jackson Pollock, Alice Neel, Grant Wood and Charles Sheeler, shifting between social realism and Cubist motifs, rural simplicity and industrial panoramas whilst gesturing with prescience towards the stirrings of pop art and abstract expressionism. These works are curiously pitched between a tentative optimism for the new world and a coded nostalgia for an agricultural past that’s fading, grappling with the American Dream whilst forging a new visual language to document the country’s collective psyche in the face of a period of turmoil and transition that holds contemporary resonance. Grant Wood’s ‘American Gothic’ from 1930 is the show’s great coup, famous centrepiece and one of the world’s most familiar, widely parodied images. This creepy twin portrait of a long-faced, God-fearing, pitchfork-brandishing farmer and his sullen daughter standing solemnly before their white wooden house is as enigmatic as ever: is Wood mocking and satirising their sour-faced Puritanism or celebrating their rustic, American Mid-West ways? Also present is his eerie ‘Death on the Ridge Road’, a Disney-exaggerated landscape depicting an imminent car accident in which the valley itself appears to be dancing with death. Elsewhere, Stuart Davis’s ‘New York: Paris’ invokes the glassy abstraction of Miro, an early, untitled Pollock references Picasso, Guston depicts the bombardment of Guernica as a gyrating tondo and William H Johnson’s ‘Street Life’ vibrantly captures a couple of black Harlem hipsters striding onto a turquoise pavement like characters from the cover of Miles Davis’s ‘On The Corner’. Charles Sheeler’s skilful evocation of the imperial Ford factory in his ‘American Landscape’ is suffused with a palpable ennui, a paean to the new industrialisation whose solitary, scurrying figure uncannily intimates an almost Hopperesque alienation. Which brings me to the star of this exhibition. There are only two Hopper paintings here but both of them lend a sense of what Olivia Laing describes as ‘separation’ in her wondrous, genre-splicing book, ‘The Lonely City’. ‘Gas’ is a gorgeous, melancholy glimpse of a gas station attendant shutting up as the darkness of a rural evening encroaches. It’s imbued with a lingering isolation and displacement shared by many characters in the painter’s canon; its portrayal of back country America must have influenced the noirish tension between civilisation and nature and disquiet in much of David Lynch’s output. 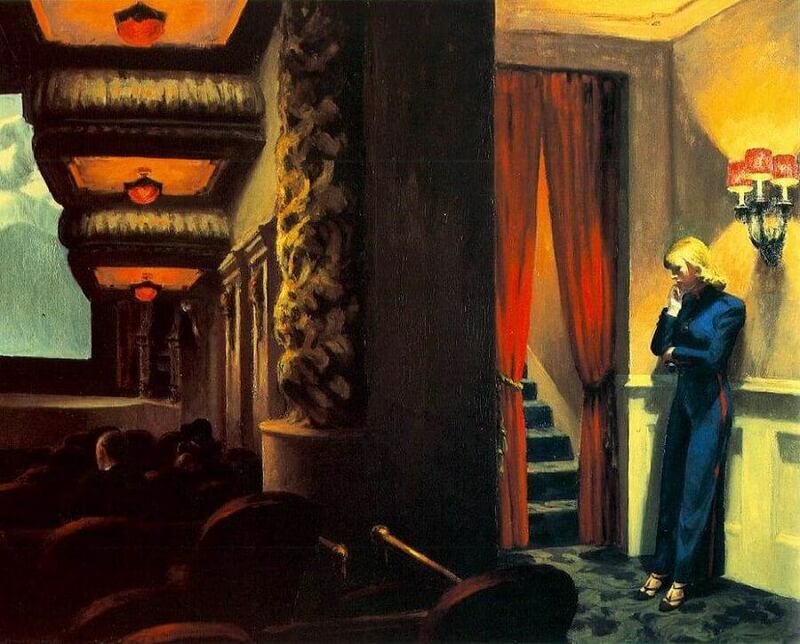 In ‘New York Movie’, an usherette stands in the dimly lit theatre stalls, lost in a reverie whilst the audience watches a black and white film, like a frozen fragment of cinema itself. Both figures appear fraught and penned in, enveloped by a silent desperation and unease; Hopper’s effects are languorous and graceful. This is a quietly absorbing exhibition that benefits greatly from its considered brevity: regardless of style and mood, each individual painting carries a subdued elegance, even when transmitting states of anxiety.